The personalised college stickers are part of Hike’s strategy to connect with wider college groups. The stickers are available for download in Hike’s sticker shop within the app on both Android and iOS from 12 September 2017. Hike has released over 500 new stickers for its messaging app. The stickers are made for connecting with college students at a local level and are personalized accordingly. Hike claims to have conducted a social experiment across various college campuses in order to create these specialized stickers. The stickers cover well-known campuses such as IIT Delhi, JNU and DU colleges from Delhi, IIT Bombay, Mithibai and Xaviers from Mumbai, MS Ramiah and RVC from Bengaluru and these colleges get sticker packs in their campus lingo. 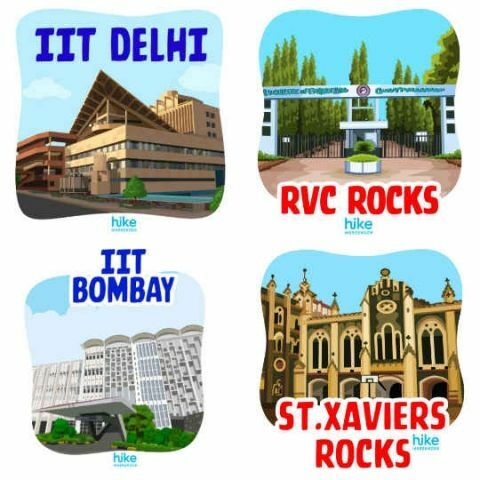 Hike Messenger, India’s first homegrown messenger, today announced the launch of its hyperlocal strategy wherein personalized stickers have been created for over 500 colleges across the length and breadth of India. The stickers are available for download in the sticker shop within the app on both Android and iOS from 12 September 2017. A social experiment was conducted across 18 colleges in Delhi, Bangalore, Pune and Ahmedabad to get a deeper understanding of the youth behavior and how to enhance the product experience. Special sticker packs were created for each of these colleges. It became an instant rage with the college students and engagement went up by over 40% and multiple new groups joined Hike across cities. Above all, our team received hundreds of requests from other college students for localized and specific stickers for their colleges. So this initiative is being extended to colleges across regions and Hike is creating special and personalized stickers for over 1000 colleges by 2018. A large percentage of the Hikers are between 18-21 years of age and in college. The youth live their lives with multiple friends groups on campus and these college sticker packs make their conversations so much more personal. It also adds to a sense of pride and a sense of belonging to their college and the groups that they are associated with. Every college is defined by its favourite food, iconic characters, buildings and other colourful references. The Sticker Team at Hike have carefully curated and designed these sticker packs to give Hikers a way to express college culture in their conversations with peers and in their groups. Instead of typing ‘Let’s meet in the auditorium’ or during college fests cheer for ‘their college’ or meet their BAEs at a hangout one can simply say it with the a custom college sticker. The Spokesperson at Hike Messenger said, “College life is a very special and memorable time for the youth. They make multiple friends across many groups. I am really excited about our hyper local strategy with colleges. Stickers are a hugely popular means of expression by the youth. And these special stickers will make the experience so much more personal for our Hikers. We plan to introduce sticker packs for several thousand colleges across India before the end of the year and our teams are working round the clock to make this happen”. Stickers are one of the most loved features of Hike. Hike offers a library of highly local 15000 stickers in 40+ languages. Multiple genres are covered across 550+ sticker packs which highlight the colorful, cultural landscape of India, Bollywood, comedy, festivals, cricket, kabaddi, local catchphrases, emotions, and even excuses. There is also the nifty text-to-stickers feature on Hike chat that can turn any message you type into a fun sticker. Stickers are expressive and a great way to say what you feel. Hike’s most popular stickers reflect love, laughter, and fun. Over 300 million stickers are exchanged every day! The recent launch of Hike 5.0, brought App Themes, Night Mode, Magic Selfie and Hike Wallet with colorful Blue Packets, this new addition further personalizes the experience for Hikers and makes it very special.To make your conversations more expressive, simply download the Hike app from the App Store or the Play Store. Navigate to the Sticker Shop and search for your college to download the all new sticker pack made for your college.